When you buy a bottle of gin, do you give much thought as to where it came from? A small distillery nestled in green hills next to a sparkling river, perhaps? Or sitting proud on the wild coastline from whence the brand gets its marine-based botanicals? While this could be true, the very opposite is also possible. Because one of the less well-known aspects of the gin world is contract distilling, where an individual or company commissions a distillery to help them develop and make a product that they can then sell. 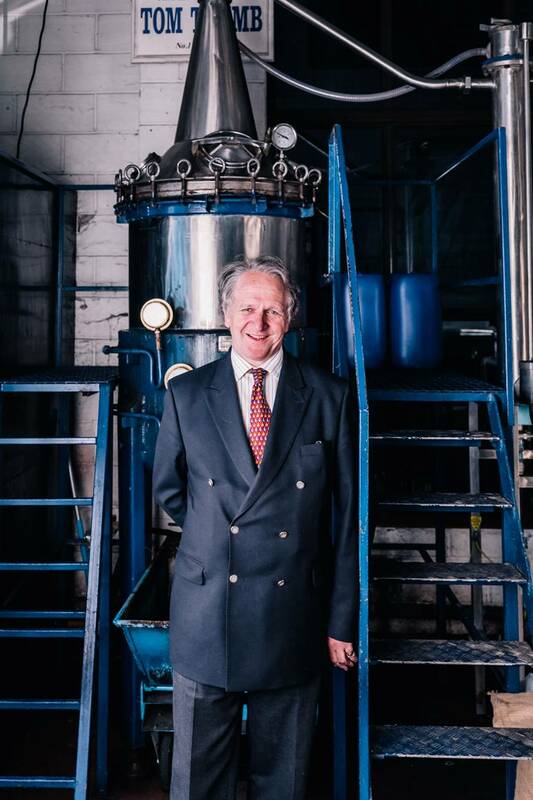 The leader of the pack when it comes to contract gin distilling is Charles Maxwell and his Thames Distillery. Located in a nondescript industrial estate in Clapham, this isn’t the realm of green rolling hills. This is the business end of the industry. There’s still romanticism here, however. Charles is the latest in a long line of distillers, which dates way back to the 17th century. ‘My eighth great-grandfather was apprenticed in 1688. From that day to this we’ve been distilling gin in London,’ he explains as we sit in his work-worn office. Maxwell himself is tall, with wiry gray hair and glasses worn low on his nose, a mildly mad professor in looks, with a friendly demeanour and wry sense of humour. We’re surrounded by bottles of gin – they’re crowded on windowsills, the tops of filing cabinets and tables, and Charles sits at a cheap MDF table piled with papers and a laptop. Below the office is a noisy bottling line chugging round, while outside in the yard, gin sits in huge plastic containers, brand names scribbled on them, waiting to be driven and occasionally shipped to customers. It’s in another smaller building across the way that the alchemy happens, where two 500-litre stainless steel stills called Tom Thumb and Thumbelina sit, awaiting their next run. With the gin boom, he says, business is good. But it hasn’t always been this way, with Charles and his family navigating a rocky patch that lasted 50 years. Back in the 1960s, his father was facing a difficult decision. As the chairman of the Finsbury Distillery Company, the family’s company that was founded in 1740, he looked around the boardroom table and realised that with one other exception, everyone was over 65. ‘They did some calculations and realised that if they didn’t find somebody to get married to, we would end up being forced sellers because there wouldn’t have been enough cash around to pay the draconian inheritance tax of the time,’ he recounts. which ended up being a relatively good fit for everyone. Joining Matthew Clark in 1976, Charles worked in numerous parts of the business, learning the ropes. He had to fight his way in, however, as his parents were less than enthusiastic about the idea of their son joining the drinks industry. Charles was a director of Matthew Clark, and unhappy with the direction that the then chief executive was taking the company in. He left in 1992, leaving behind a company his family had been involved with for 250 years. He wasn’t out of the game for long, however. The very next week Charles was buying distillation equipment from some administrators. He tried to make a go of contract distilling, but found themselves selling a few years later. ‘We sold out in ‘95 precisely because the gin market was where it was,’ he recalls. Fortunately for him, the new owners of his distillery were cowboys who ‘took HM Revenue & Customs for quite a considerable ride’ before disappearing. So, it was in 1997 that Charles found himself buying all his distillation equipment back off the administrators. ‘[From 1997] we went through 10 years of pretty tough trading. But by 2007 the green shoots on my new gin tree were beginning to show through. From that day to this, the last 10 years have been a lot easier and a lot more fun. With two new finished products sitting waiting to be bottled and another 10 at various stages of development, it looks as if gin fans will have plenty of new products to explore for some time to come. With such a long and storied history in the industry, it’s no surprise that Gin Magazine has made Charles its first Hall of Fame inductee. The Gin Guild also decided to award Charles its inaugural Lifetime Achievement Award in 2014.
age of today, one thing has been constant in the gin universe, and that is Charles Maxwell’s complete dedication to his craft, helping prospective new gin producers to navigate the choppy waters of recipe creation. Our spirits shelves are a lot brighter as a result. Charles Maxwell was announced as the first inductee of our Gin Magazine Hall of Fame at the Gin Magazine Awards dinner on February 15 2018.